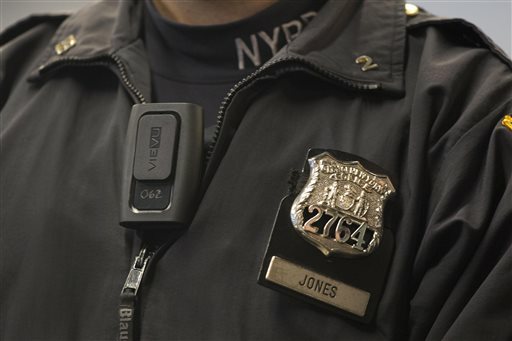 New York Police Department Officer Joshua Jones wears a VieVu body camera on his chest during a news conference in New York. With tensions running high over the killings of blacks by police, departments around the country are changing policies and procedures to curb the use of deadly force, ease public distrust and protect officers from retaliation. New York City plans to issue stun guns to hundreds more officers. The Milwaukee department is making crisis-intervention training mandatory. And in Akron, Ohio, police have begun working in pairs on all shifts for their own safety. Police departments are constantly updating training. But some of the more recent measures have been prompted by rising anger toward police. And in some cases, departments are making sure to let the public know about these changes. “It’s not a mistake or a coincidence that a lot of these departments are publicizing their training or are perhaps revamping their training guidelines and things like that in the wake of these really high-profile incidents,” said Kami Chavis Simmons, director of the criminal justice program at the Wake Forest University School of Law in North Carolina and a former federal prosecutor in Washington. Protests, largely peaceful, have flared across the country after grand juries in recent weeks declined to indict white officers in the fatal shooting of 18-year-old Michael Brown in Ferguson, Missouri, and the chokehold death of Eric Garner in New York City. Both men were black and unarmed. “There’s a lot of well-meaning chiefs out there that want to do the right thing, and they are looking for ways that they can address not just use-of-force issues but bias issues,” she said. Two recent police shootings in Ohio started with reports of people with guns: the killing last month of a 12-year-old boy carrying a pellet gun in Cleveland and the death last summer of a 22-year-old man holding an air rifle in a Wal-Mart in suburban Dayton. In both cases, the officers said they thought the victims had real guns. The officer who shot the 12-year-old resigned from a suburban Cleveland police force in 2012 after his supervisors decided he lacked the maturity to work in their department. Ohio Attorney General Mike DeWine responded by asking the state’s police training commission last week to study possible updates in the way officers learn their jobs. — In Missouri last month, a federal law enforcement team held training for St. Louis-area police, including top commanders from Ferguson, on how unintentional bias affects police work. Similarly, St. Louis Police Chief Sam Dotson said he hopes to introduce wider training for officers about recognizing “implicit bias” and making better decisions about when to shoot. — The Obama administration issued guidelines this month that restrict the ability of federal law enforcement agencies to profile on the basis of religion, national origin and other certain characteristics. The Justice Department hopes those measures become a model for local departments. Several police forces were updating their practices even before the Ferguson and New York deaths, with some departments issuing body cameras to officers. After Philadelphia Police Commissioner Charles Ramsey arrived in 2008, for example, the department began placing police shooting statistics on the Web for the sake of openness and started a pilot program involving body cameras. Associated Press researcher Jennifer Farrar contributed to this report. Welsh-Huggins can be reached on Twitter at https://twitter.com/awhcolumbus. Meanwhile yesterday, Fox News, in typical Fox News fashion, was covering the anti-police brutality protests by referring to them as “anti-police protests” – including in big letters across the screen, just in case anyone missed the anchor saying it. A change of tactics indeed! It seems the Fraternal Order of Police has hired a public relations firm. Change will come when the number of incidents of unnecessary force and shooting of unarmed civilians goes down. That would be change.